I’m on a Boat!!! Well…I was on Wednesday and that’s where I got the picture for this week’s post. Hopefully you get the reference and if you don’t shame on you, go watch some SNL highlights. Unlike the members of “The Lonely Island” I was not on a boat to shoot a music video with T-pain (damn), I was celebrating my parent’s 30th wedding anniversary. We spent the evening on the Duchess which is part of World Yacht’s fleet of party boats. 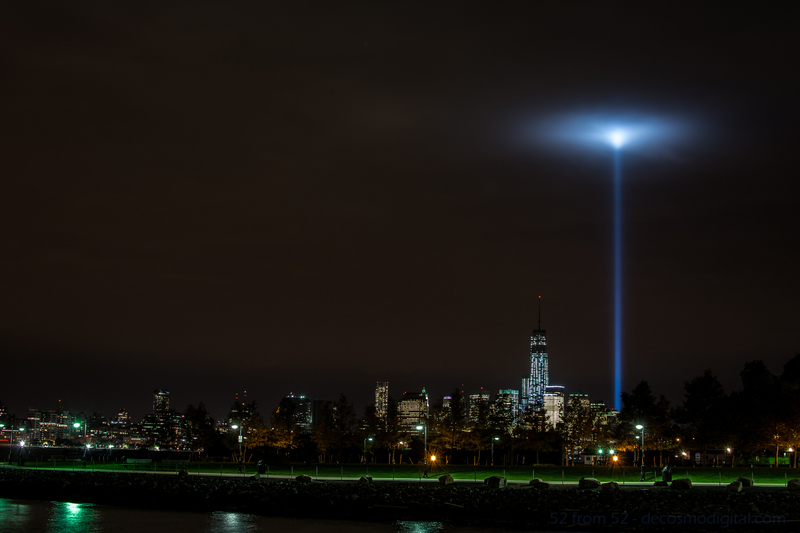 Our cruise left from pier 81 at around 7PM and provided us with beautiful views the entire night! 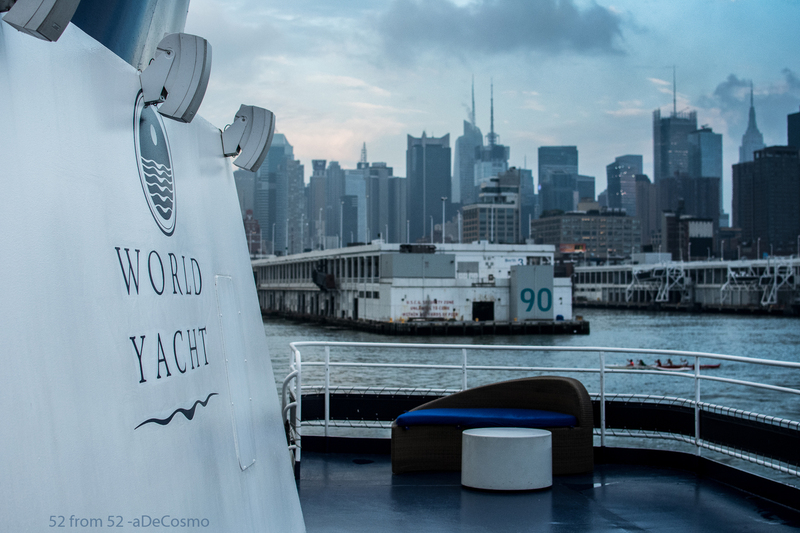 I highly recommend booking a trip on World Yacht if you’re looking for a unique way to celebrate an occasion or trying to plan a memorable night out in the city. Going into the evening I knew I’d have plenty of scenic picture opportunities but since I was there for my parents the time I could devote to getting a picture was limited. Luckily I ended up sitting right next to a window which opened and allowed me to lean out and get this week’s picture. 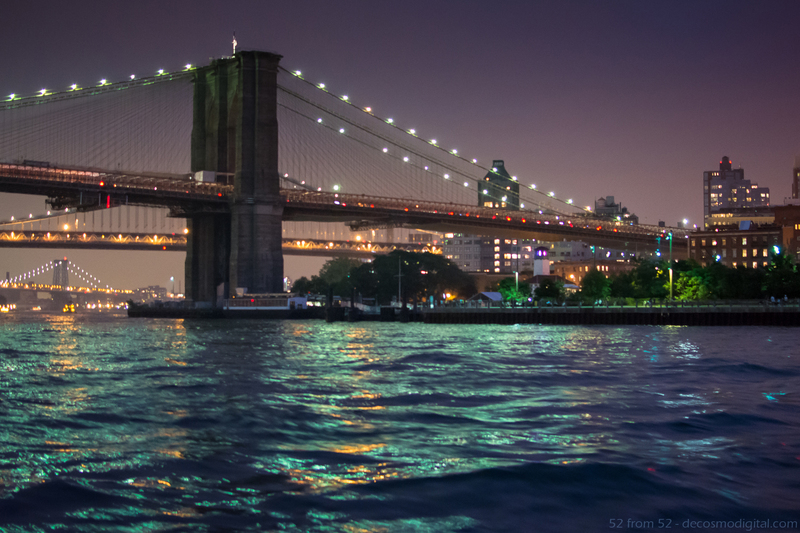 The Brooklyn bridge is one of the most iconic New York City landmarks so when it appeared on the horizon I immediately put my steak knife down and grabbed my Nikon. The shot I got is of the “BMW” bridges or Brooklyn, Manhattan, and Williamsburg bridges as we traveled North on the East river. If there was one overall lesson I learned this week, it’s that taking pictures on a boat and at night is VERY difficult. First, the lighting is inconsistent (low, high, indoor, outdoor) which makes it difficult to tune in your exposure. Second, surprise the boat is moving good luck focusing! Third, if you’re taking pictures of subjects off the boat you have to act fast because you have a very small window to get the shot you just saw. As a result of hitting moving targets your composition is constantly changing. Normally when you frame up a picture you’re standing still so you can get a couple pictures, not on a boat, snap fast and often! In my opinion the combination of moving targets and low light was definitely the hardest aspect of this week. This picture was tricky and I definitely wish I had a couple more shots at it. Just like last week I had to use a high ISO but this time it was almost double (4000) which starts to show the negative attributes of a high ISO. My picture (pre-edit) was a little grainy which is what happens when you use a high ISO. I won’t try to explain why graininess (aka noise) happens but there are plenty of places to read about it online (one linked below). While editing my picture in Lightroom I did my best to lessen the graininess by using some noise reduction corrections, which made for a softer (less sharp) image. 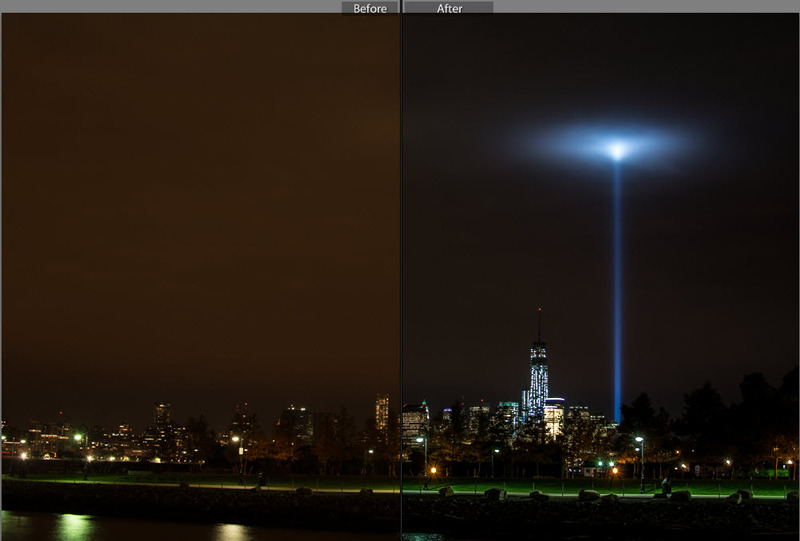 This is the first time I’ve mentioned Lightroom but let me tell you, it’s awesome! I’ll talk more about it another time but I highly recommend it for editing/organizing all your pictures. Other than a high ISO to make up for the limited amount of light I also had to use a wide aperture (f/2.8) and slow shutter speed (1/13 of a second!). Now remember slower shutter speeds blurs motion so using one on a moving boat is risky. I think this picture came in focus enough but if I was on land it would have been a lot sharper and I probably would have used a tripod. I could have opened my aperture more (max f/1.8) to enable a faster shutter, but the wider the aperture the shallower the depth of field which isn’t ideal for a landscape picture. As I mentioned earlier the window (especially when shooting through a literal window!) of opportunity for a picture is limited so I didn’t have enough time to work my way up the aperture scale (large to small). Even if I had more time though a shutter of 1/13 is already too slow so I couldn’t drop that any further which I’d have to do if I shrunk my aperture. As I said, this was a tricky picture. One more big lesson that I learned this week (which isn’t really demonstrated in this picture) was the importance of white balancing. While taking picture inside the boat everything seemed yellowy due to the indoor lighting. Once the light stabilized inside I took a couple pictures of my white balance cards in the different parts of the boat so I could adjust everything in Lightroom later. Let me tell you WOW what a difference!! I’ll try to get a picture in the coming weeks to demonstrate the usage of white balancing. If you’re a beginner like me you’re going to be surprised by the results.